It's a holiday week, so there are no meetings on the City Hall schedule. There's a lot of action, however, as people decide whether to file for any of the open seats on the City Council. Filings opened yesterday and end July 18, so we don't have to wait long for an answer. The filing period is the same for the Northfield Public Schools, where three School Board seats also are open. The three City Council positions open are those now held by Jim Pokorney in the first ward, Galen Malecha in the fourth ward and Dixon Bond, who serves at-large. All positions serve a term of four years, 1/1/2007 - 12/31/2010. The filing period begins on Wednesday, July 5 at 8 a.m. and closes on Tuesday, July 18 at 5 p.m. Interested candidates must file an affidavit of candidacy with the city clerk at the Northfield City Hall, 801 Washington Street, Northfield. There is a $5 filing fee. Candidates must be qualified to vote, be at least 21 years of age on the date he or she would assume office, a resident of the City and of any ward he or she seeks to represent, or will become a resident therein at least 30 days before the election. If more than two people file for a position, a primary election will be held on Tuesday, September 12. The general election will be held on Tuesday, November 7. Contact Deb Little, City Clerk, for additional information. Wednesday evening we made like tourists, complete with cameras, sandals, and shorts, and took a bus tour. The Planning Commission, along with city staff members Brian O’Connell and Dan Olson as tour guides, spent almost two hours driving all around Northfield. The purpose of our adventure was to be better able to visualize our “sense of place” as a group by sharing the common experience. I thought that it was very worthwhile. Pictured here is our tour group, wearier but wiser for our efforts. This journal of our journey represents my own thoughts. It does not necessarily represent the opinion of the entire Planning Commission and has nothing to do with my role as part-time executive director of the Northfield Downtown Development Corporation. I have done my best to capture the comments made by the participants on the tour. Editor's note: Our thanks to League of Women Voters member Kiffi Summa, who was kind enough to send these notes, along with a challenge to people to get involved in an important civic discussion. You can do that by adding a comment here or joining the dialog on the ISSUES List. The Northfield League of Women Voters (LWV) devoted its "4th Monday" public meeting in June to discuss expansion or replacement of the Northfield Carnegie Library. The meeting was hosted by Lynne Young, library director, and Mark Gleason, chair of the library board. Lynne began with a short tour of the library, which clearly illustrated the many space problems the library currently faces. There is a lack of shelf space for developing/growing the collection, but an even more pressing need is for additional work space for all the behind-the-scenes work of processing materials, inter-library services, etc. It's the end of the month and next week is a holiday, so We're moving into a light schedule of public events. All are at City Hall unless otherwise noted. You can click on the links to see details when they become available. Zoning Board of Appeals, 7 p.m.
Planning Commission Bus Tour, 5 p.m.
ArtsPlan06 Stakeholder Forum, 6:45 p.m., Northfield Community Recreation Center, Room SS 103. The Northfield Human Rights Commission is accepting applications for one vacancy on its commission. Interested persons are invited to pick up an application at the Northfield City Hall, 801 Washington Street. Applicants will be invited to attend a regular Human Rights Commission meeting to meet current members and ask questions. Members are appointed by the mayor of Northfield with the recommendation of the Human Rights Commission. Efforts are made to draw from a broad cross-section of the community, and appointments represent both sexes, various economic levels, including welfare recipients, members of the business and professional community, renters and homeowners, racial and ethnic minorities, various religious groups, and a wide age span, including senior citizens and students. A new Economic Development Plan, changes in the downtown historic district's building restrictions, a nearly $2 million plan to buy wireless automated meter-reading technology, and plans for an innovative artists' studio/housing center downtown are all up for discussion this week. The council is slated to set a July 10 public hearing on the approval of $33 million in bonds for Northfield Hospital's plans to build a clinic on its Northfield campus and another in Farmington. The bonds will be paid through hospital revenues and not the city's general budget, so there will be no tax increase. In other hospital business, representatives will discuss progress on sales of two homes and three lots near the former hospital site. In addition, the council is slated to approve $3.21 million in bonds for the new outdoor swimming pool, with payments that will come out of the annual city budget at a rate of between $110,000 and about $245,000 a year through 2025. In a technical move, the city will lease the pool to the Economic Development Authority, which will issue the bonds. We have the dates and time for all the government meetings this week. But we can't tell you whether you need to ink them into your schedule. The agendas aren't all available yet, but you can check the City Hall website to watch for them. City Council, 7 p.m. Monday. This is a work session, but no agenda is posted yet. Planning Commission, 7 p.m. Tuesday. The commission is expected to make a recommendation on the planned unit development of the Rosewood 5th Addition, then continue its discussion of the city's comprehensive plan. The Park and Recreation Advisory Board, 7 p.m. Tuesday. No agenda is available. Heritage Preservation Commission, 4:30 p.m. Thursday. No agenda is available. We took our Locally Grown show recording session to The Tavern's outdoor patio this afternoon. Our guests: Don Tarr, Chair of the Northfield Housing and Redeveloment Authority; and Kris Vohs, City Councilor and member of the HRA. Our topic: Northfield and the need for workforce housing. Click photos to enlarge and continue reading to hear the whole show (30 minutes). The 'Sphere is back from Sin City - tanned, rested, and with both of my kidneys. That's a successful Las Vegas trip by any standard. Since the 'Sphere's been out of the loop for a while, it's *_Current Events_* as the topic this week: things being built, things being torn down, and everything in between. Editor's note: This is the second part of a story we started yesterday outlining the issues surrounding a proposed new movie theater in Northfield. The Northfield City Council, faced with a need for both commercial and light industrial land, reached a compromise Monday that maintains a little of each. "I like this better than the last meeting," said Steven Payne, vice president of Lakes & Rivers Cinema, which plans to bring a multi-screen cinema to seven acres along Canon Road, just off Hwy. 3. He was referring to the May 23 meeting of the Planning Commission, which rejected the land use designation needed as a first step to rezoning for a theater. 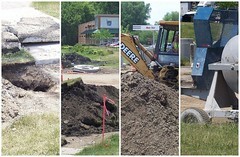 The big Highway 3 road construction project continues in Northfield. N.org is there, and while "our online construction photo gallery":http://flickr.com/photos/northfield_mn/sets/72157594156650253/ won't make your trip any quicker, we hope that the indication of progress will make it a little cheerier. The construction this summer is in two phases. Phase One (the current phase) is scheduled to be complete by August 18th, "according to MNDOT":http://www.dot.state.mn.us/d6/projects/hwy3/index.html. Phase two will start after that and finish in October. This means that there may be some significant DJJD(Defeat of Jesse James Days) traffic impact. I’m not a bookmaker, but if I were, earlier this weekend I would have put the odds of getting a successful, for-profit movie theater in downtown Northfield about even with Barbaro running another horse race. That doesn’t mean there aren’t ways to have some movies downtown. It’s just that people may have to be more creative in looking for options. And I'll be honest, just before I filed this story I found an option that while still a longshot, may improve the odds just a bit. The past and the future come together this week as the city deals with plans for a new movie theater and begins plans to divest itself of some land that was part of the former Northfield Hospital site. City Council: meets at 7 p.m. Monday at City Hall. The key issue will be a vote on whether to adjust the city’s comprehensive plan to designate about 10 acres of land along Highway 3 for commercial use, rather than light industrial. Technically, the issue isn’t a rezoning, and it’s not tied to a specific use of the land. But in reality, the move is needed to allow a rezoning that would allow property owner James Gleason to sell his land to Steven Payne, owner of Lakes & Rivers Cinema. Payne, who has developed eight cinemas in small towns in Minnesota and South Dakota, wants to build a theater similar to one he owns in Owatonna. If the city refused the change, Payne and Gleason plan to build the theater on an adjacent site across the city boundary in Dundas. The land, directly across from Target and Cub Foods, (in the distance past the familiar intersection pictured here), lies between the busy highway retail area and the light industrial area to the west. We just pulled this from the City Hall website. An informational meeting outlining the process for the sale of four houses (including the one pictured at left) and three vacant lots from the former Northfield Hospital campus will be Tuesday, June 6, from 7-9 p.m. at St. John’s Church, 500 West Third St. At the meeting, representatives of Northfield Hospital will present their plan for disposing of the properties within guidelines established by the Northfield City Council. There will be an opportunity for questions. City representatives will also be at the meeting. The former hospital site and adjacent homes owned by the city cover 4.73 acres in the 800-block between West First and West Second streets. The city council decided in 2004 that the 2.7 acres donated for the 1938 hospital be used to expand Way Park. To underwrite a portion of the cost of removing the old hospital, the hospital is authorized to sell the houses and vacant lots acquired after the original hospital was built. An article in the StarTribune reported that the Northfield School Board voted 5-2 tonight to withdraw sponsorship for the Village School of Northfield, a public charter school that was established in 1997. Of the 125 charter schools that have opened in Minnesota since 1991, the Village School is just the eighth to lose its sponsor. Concerns over student safety, behavior and academic performance had been raised over the past few months, and the school's situation was a topic of discussion on our ISSUES list in early April, when it was first reported that the school board was considering this possibility.